Last Friday, The Wall Street Journal declared that public radio is facing what it called an “existential crisis” — a disaster supposedly brought on by public radio’s aging audience and NPR’s financial dependence on fees coming from increasingly challenged local member stations. But one person’s existential crisis is another’s opportunity; a period of expanding audiences, creative disruption, and greeting the future. From where I sit, at the helm of New York Public Radio, the news is overwhelmingly positive and the terrain is open for anyone bold enough to embrace what is undoubtedly radio’s next incarnation. · In the last four years, our audience has expanded across all available audio and digital platforms, doubling to 20 million monthly. · We have expanded our production of high-quality content that seeks to speak the truth about the issues of the day and welcomes everyone to the table for a new kind of conversation. · We believe in the platform of radio and its future; we also believe in the power of the podcast not just to reach large audiences, but also to foster new communities. · We have built new audience and activity by creatively attacking our own conventions and by repositioning the idea of public radio as something fresh, relevant and not to be missed. We’re proud of all that, but it’s clearly just a start. I’m calling on my colleagues throughout public media — some of the nation’s smartest, most courageous, and most dedicated leaders — to join the disruption as we chart a new path forward. Here are some steps we can take together. #1: Embrace the podcast, find the next generation of voices, and at the same time embrace radio. We have to own the space where new audiences are flourishing. That’s the key to finding a greater diversity of listeners, to attracting new talent, and to building the kind of loyalty and community upon which public radio was built and which will sustain us into the future. Yes, we must also transform our traditional platforms. But it’s not an either/or proposition. They exist together. We can listen to the radio and podcasts, just like we watch TV and Netflix. And each is used differently by different people. We must create content for the platforms and the behaviors of the next generation. The death of radio has been predicted at least once a generation starting with the first flicker of the cathode ray tube — and yet here we are. Ninety three percent of American adults still listen to radio every week. But wherever there are available ears, we will look to serve them. So we’ve invested heavily in podcasts and on-demand listening as a strategy to reach people locally, nationally, and globally with audio that’s worth their time. The podcast allows us to aggregate large and passionate audiences directly, without facing the challenges of individual radio schedules. It recognizes the control that listeners want over what they listen to and when. And it leverages the rise of the smartphone, a streaming radio and on-demand hard drive in your pocket. Last fall we launched WNYC Studios, an original production company birthed in the age of the podcast, meant to bring new talent to expanded audiences with new program types, new business models, and the recognition that we need to create content for the America that is emerging. We’ve launched six new programs from the Studios in its first year including The New Yorker Radio Hour and Only Human. We have a slew of projects in the pipeline with wonderfully talented partners. Last week, The Daily Show’s Jessica Williams and comedian Phoebe Robinson performed a live taping of their hit podcast 2 Dope Queens produced by WNYC Studios. The audience was young digitally savvy podcast fans who laughed uproariously. Jessica and Phoebe talked about pretty serious stuff — breast cancer, racism, and the shooting in Orlando. 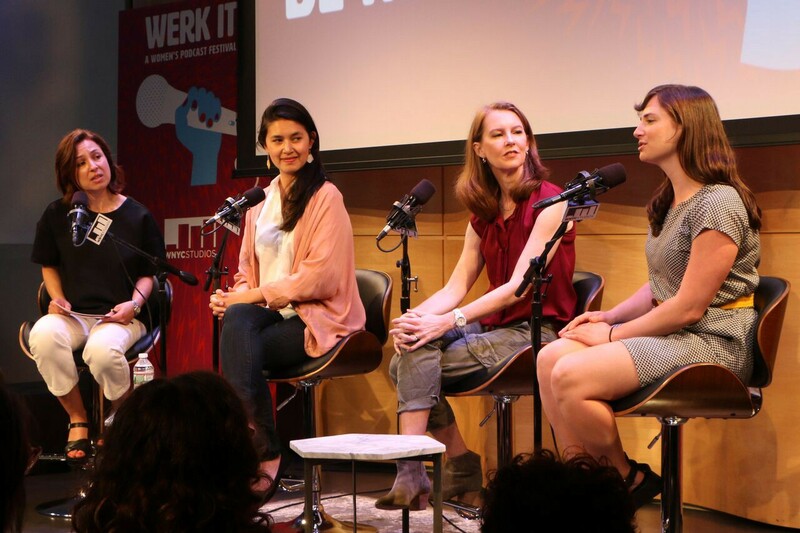 These women and their guests don’t sound anything like traditional public radio. And that’s a good thing. Public radio is not just embracing podcasts but dominating the space. As I write this, five of the top 10 podcasts on iTunes are from public radio producers, including This American Life, Invisibilia, and More Perfect, the Radiolab spinoff that allows Jad Abumrad another way to exercise his creative capacity. At WNYC, we fervently believe that every market, every public radio station has within its reach a local personality with big appeal and a big idea or a journalist waiting to reach listeners in new and exciting ways. #2: Redefine the role of the local public radio station by paying attention to the ideas of “community” and “now” and become indispensable. Radio has always been present, nimble and fleet of foot. But in the last decade, much of commercial radio has become centrally programmed and talk stations build audiences on the back of syndication. That’s why we must become the drivers of community, the conveners of the conversations we must have with each other. At WNYC that means There Goes the Neighborhood, an original journalism series produced in partnership with The Nation, about gentrification in Brooklyn that sounds and feels like an ongoing serial. In There Goes the Neighborhood, we hear the voices of our neighbors addressing the issues of our community. We must also rediscover the concept of now. It’s no longer acceptable to broadcast just a series of programs that can be heard anytime. As local broadcasters, we must create the live magnetic pull of life as it unfolds, from urgent events in Orlando to the impending snowstorm to the local team in the World Series. We must give listeners a reason to use our service. We must demonstrate that we understand who they are, the context of their daily lives, and their overwhelming concerns. When tensions erupted between the NYPD and many citizens of New York, we opened the phone so the city could have a conversation with itself, from Harlem to Staten Island, with many stops in between. When we learned of the death of Muhammad Ali, we created a space on the air for New Yorkers of all ages and description to share memories, tributes, and just to be with each other. In times of crisis and during the tussle of everyday life, what people need most is a community they feel connected to. Listener-supported local public radio enables us to create this kind of space. Ours is a community in which we all feel invested and in which our listeners pay for something they get for free because they understand the value of the community and connectivity we provide. We must preserve this and foster its growth in the digital age. #3: Evolve the business model between NPR and public radio stations so public radio can move more aggressively into the digital space. In addition to its role as a global newsgathering force, NPR is also a membership organization governed by radio stations who pay for news content and other services. Stations fees and radio underwriting on NPR programs make up about 75% of NPR’s budget. That means that we are all in it together, local stations, the national network, and engaged listeners. But we need to recommit to each other to face the future and compete effectively. That means we must align our respective incentives — financial and public service — so that we are collectively motivated to succeed on both radio and in the digital space. We need to make sure that big cities like Chicago and Los Angeles are served, that the great diversity across America has a seat at the table, and that voices that are threatened or without significant platforms — like our colleagues in Native American broadcasting — can see their way securely into the future. About the Author: Laura R. Walker is the President and CEO of New York Public Radio, one of the largest public radio station groups in the nation and a leader in audio content creation. The organization owns and operates 8 radio stations including WNYC and WQXR, and produces more than 25 programs for local and national radio, and digital audiences.